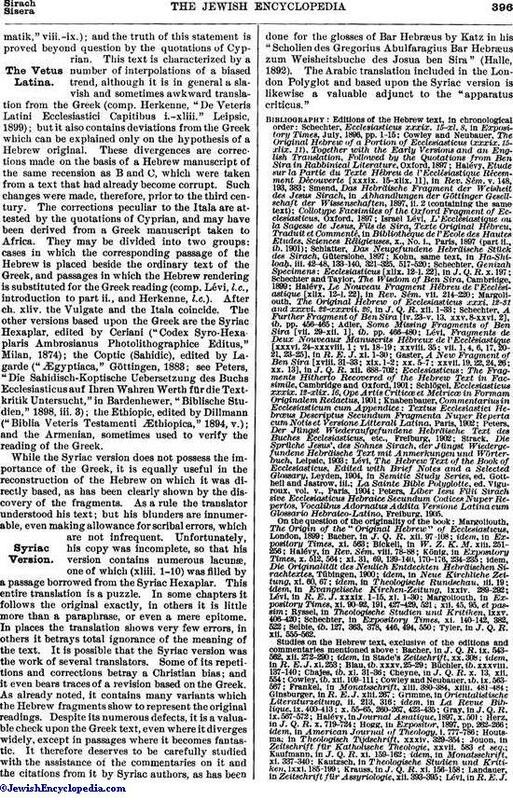 Among the books of the Greek Bible is one entitled Σοφία Ἰησοῦ ϒἱοῦ Σιράχ (Codices Sinaiticus and Alexandrinus) or simply Σοφία Σειρáχ (Codex Vaticanus). 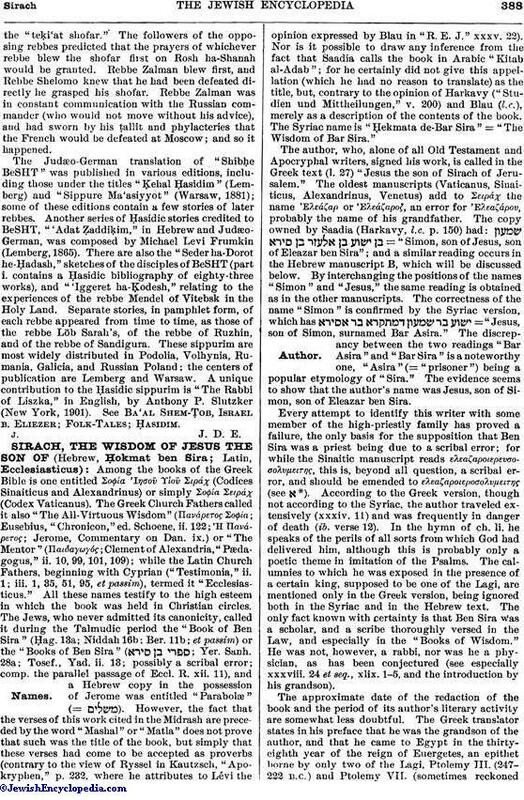 The Greek Church Fathers called it also "The All-Virtuous Wisdom" (Πανάρετος Σοφία; Eusebius, "Chronicon," ed. Schoene, ii. 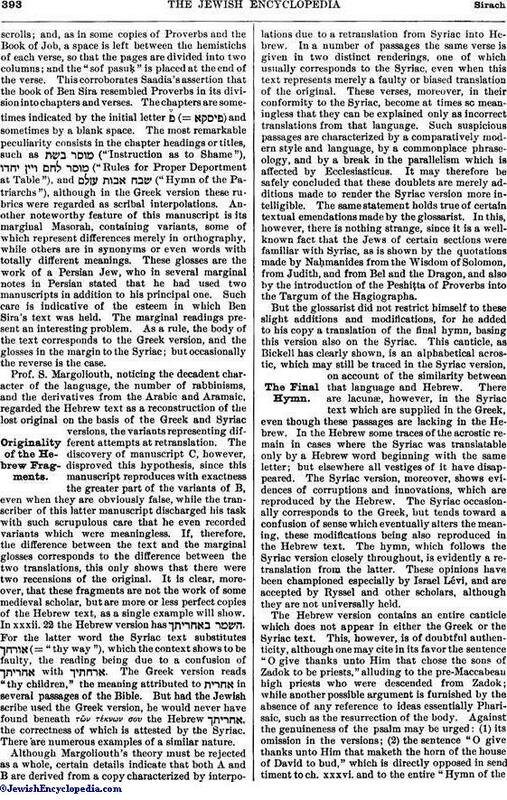 122; Ἡ Πανάρετος; Jerome, Commentary on Dan. ix.) or "The Mentor" (Παιδαγωγός; Clement of Alexandria, "Pædagogus," ii. 10, 99, 101, 109); while the Latin Church Fathers, beginning with Cyprian ("Testimonia," ii. 1; iii. 1, 35, 51, 95, et passim), termed it "Ecclesiasticus." 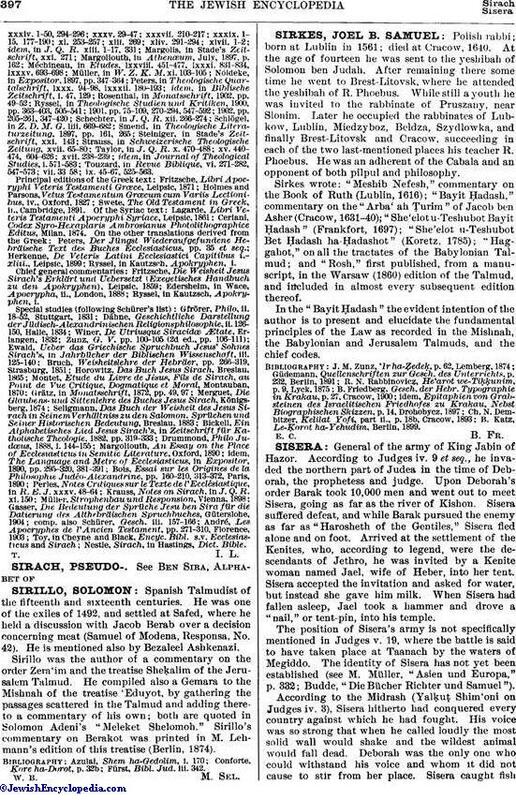 All these names testify to the high esteem in which the book was held in Christian circles. 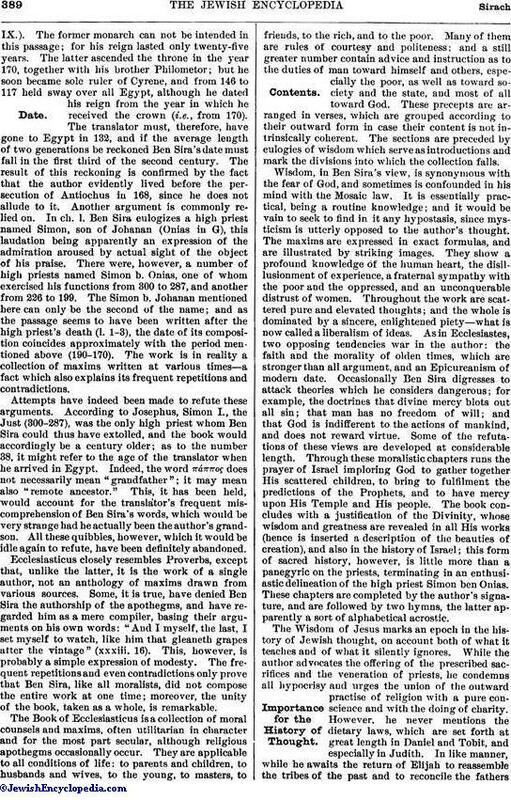 The Jews, who never admitted its canonicity, called it during the Talmudic period the "Book of Ben Sira" (Ḥag. 13a; Niddah 16b; Ber. 11b; et passim) or the "Books of Ben Sira" ( ; Yer. Sanh. 28a; Tosef., Yad. ii. 13; possibly a scribal error; comp. the parallel passage of Eccl. R. xii. 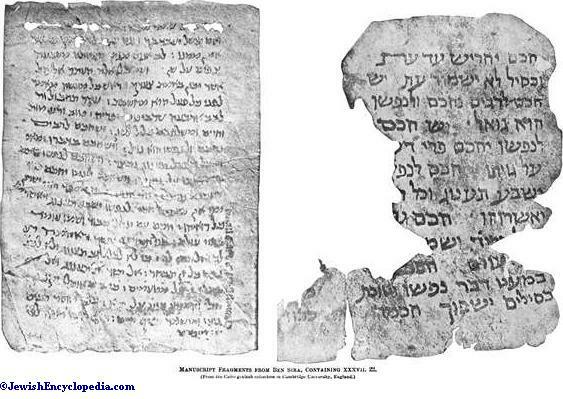 11), and a Hebrew copy in the possession of Jerome was entitled "Parabolæ" (= ). 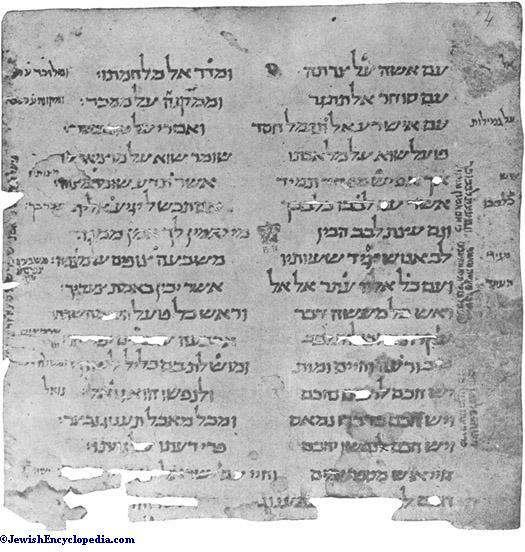 However, the fact that the verses of this work cited in the Midrash are preceded by the word "Mashal" or "Matla" does not prove that such was the title of the book, but simply that these verses had come to be accepted as proverbs (contrary to the view of Ryssel in Kautzsch, "Apokryphen," p. 232, where he attributes to Lévi the opinion expressed by Blau in "R. E. J." xxxv. 22). Nor is it possible to draw any inference from the fact that Saadia calls the book in Arabic "Kitab al-Adab"; for he certainly did not give this appellation (which he had no reason to translate) as the title, but, contrary to the opinion of Harkavy ("Studien und Mittheilungen," v. 200) and Blau (l.c. 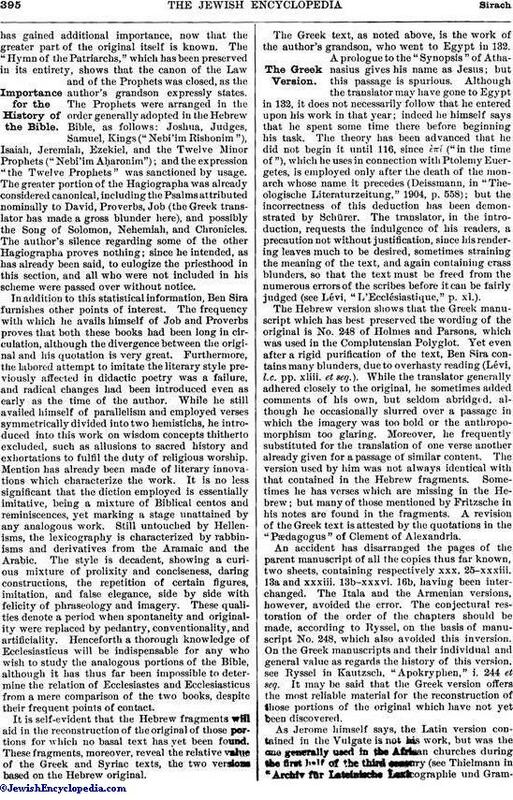 ), merely as a description of the contents of the book. The Syriac name is "Ḥekmata de-Bar Sira" = "The Wisdom of Bar Sira." Manuscript B: 19 × 17 cm. ; 22 lines per page. 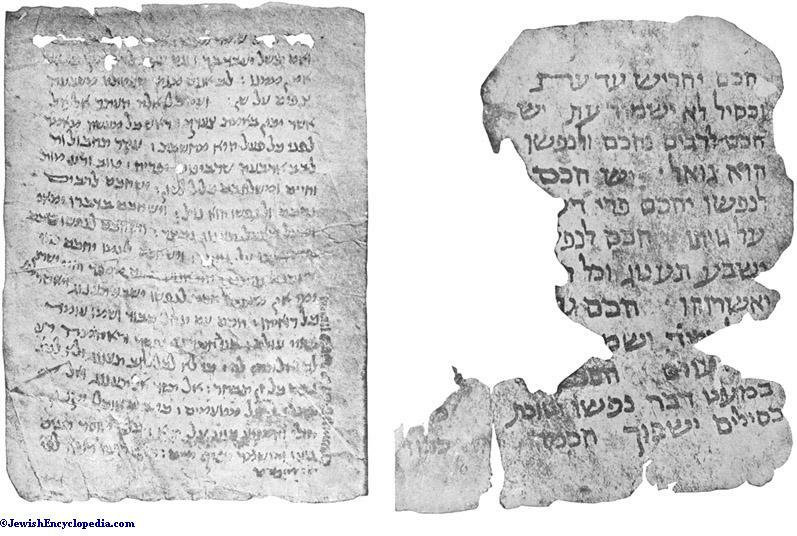 This is the most curious and interesting of all, as it contains certain peculiarities which are probably unique among all known Hebrew manuscripts. The lines are written with a stylus, as in the Torahscrolls; and, as in some copies of Proverbs and the Book of Job, a space is left between the hemistichs of each verse, so that the pages are divided into two columns; and the "sof pasuḳ" is placed at the end of the verse. This corroborates Saadia's assertion that the book of Ben Sira resembled Proverbs in its division into chapters and verses. The chapters are sometimes indicated by the initial letter (= ) and sometimes by a blank space. 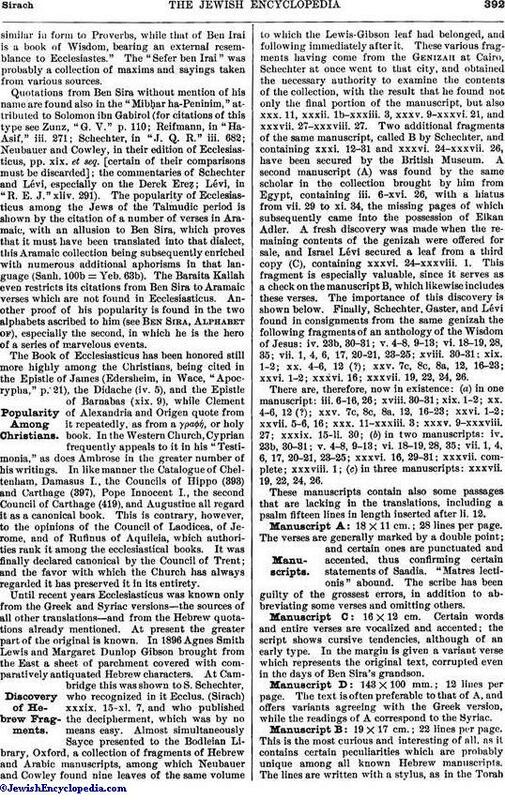 The most remarkable peculiarity consists in the chapter headings or titles, such as ("Instruction as to Shame"), ("Rules for Proper Deportment at Table"), and ("Hymn of the Patriarchs"), although in the Greek version these rubrics were regarded as scribal interpolations. 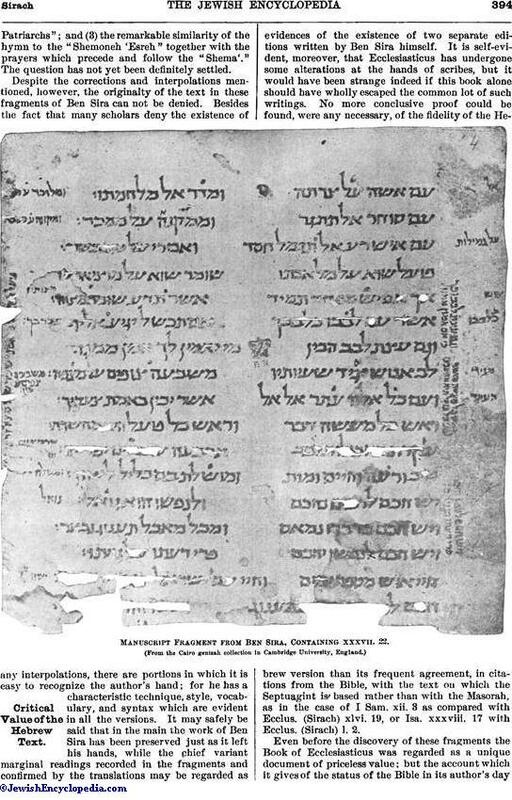 Another noteworthy feature of this manuscript is its marginal Masorah, containing variants, some of which represent differences merely in orthography, while others are in synonyms or even words with totally different meanings. These glosses are the work of a Persian Jew, who in several marginal notes in Persian stated that he had used two manuscripts in addition to his principal one. Such care is indicative of the esteem in which Ben Sira's text was held. The marginal readings present an interesting problem. As a rule, the body of the text corresponds to the Greek version, and the glosses in the margin to the Syriac; but occasionally the reverse is the case.